Dec. 30, 2010: In sci-fi movies, the first stirrings of life happen in a gooey pool of primordial ooze. But new research suggests the action started instead in the stormy skies above. 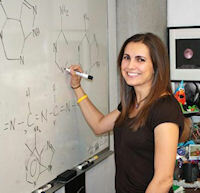 The idea sprang from research led by University of Arizona's Sarah Hörst. Her team recreated, in the lab, chemical reactions transpiring above Saturn's largest moon, Titan. "We're finding that the kind of chemistry an atmosphere can do has intriguing implications for life on Earth and elsewhere in the solar system," says Hörst. "Titan's skies might do some interesting chemistry – manufacture the building blocks of life." Hörst and her colleagues mixed up a brew of molecules (carbon monoxide(1), molecular nitrogen and methane) found in Titan's atmosphere. Then they zapped the concoction with radio waves – a proxy for the sun's radiation. What happened next didn't make the scientists shout "it's alive!" but it was intriguing. A rich array of complex molecules emerged, including amino acids and nucleotides. "Our experiment is the first proof that you can make the precursors for life up in an atmosphere, without any liquid water(2). This means life's building blocks could form in the air and then rain down from the skies!" Titan is unique in our solar system. Dotted with lakes and dunes and shrouded in a thick atmosphere of nitrogen and methane, it's a frozen time capsule of early Earth. While the liquid on Titan's surface is methane instead of water, it's the only body in the solar system other than Earth with liquid on its surface. "We didn't start out to prove we could make 'life' in Titan's skies," explains Hörst. "We were trying to solve a mystery. 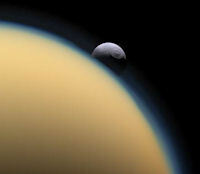 The Cassini spacecraft detected large molecules(3) in Titan's atmosphere, and we wanted to find out what they could be." "When I pressed the enter key, I expected a big 'nope, not there.'" She left for a break, and got a big surprise upon returning. "The computer was printing out such long lists I thought I must have made a mistake!" "We had about 5000 molecules containing the right stuff: carbon, nitrogen, hydrogen, and oxygen. We knew we had the elements for organic molecules, but we couldn't tell how they were arranged. It's kind of like legos – the more there are, the more possible structures can be made. And they can be put together in many different ways." How could Titan's atmosphere generate them? The answer lies in another Cassini discovery: plumes of water blasting from Titan's sister moon Enceladus. 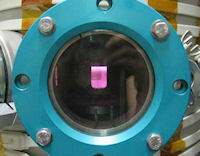 The researchers have good proof that these geysers are the source of oxygen required to kick off the first chain reactions required for life. "Water spewing across from the plumes gets broken up, releasing hydrogen and oxygen. And the amount of oxygen entering Titan's atmosphere from outside is precisely the quantity needed to make the amount of carbon monoxide detected in that atmosphere." Then, other chemical reactions(4) occur, producing the heavier molecules Cassini detected. If the lab results are correct, amino acids and nucleotides are in the mix. "We still don't know for sure what the actual molecules are in Titan's atmosphere," says Hörst, "but there's a distinct possibility that life's precursors are raining down on the surface of Titan." Picture it: One moon spraying another moon with water to generate the building blocks of life, which fall to the surface in a storm of methane rain. Real life may be stranger than science fiction, after all. (1) The researchers used carbon monoxide in their simulation because it's the most abundant oxygen-containing molecule in Titan's atmosphere. The oxygen amount in early Earth's atmosphere is thought to be much like the amount in Titan's atmosphere but was in the form of carbon dioxide instead of the carbon monoxide found on Titan. Later, life on Earth introduced significantly more oxygen to Earth's atmosphere. Titan still has very little oxygen, especially compared to Earth today. The sun's UV rays break up methane and molecular nitrogen in Titan's atmosphere, so they used radio waves to recreate that process and free the molecules to recombine into new kinds of molecules. (3) Cassini detected oxygen ions flowing into the top of Titan's atmosphere. The spacecraft also found heavy molecules, 100 times the size of methane, in the haze. But Cassini's instruments weren't sensitive enough to identify them. (4) The water is broken up either by energetic particles around Saturn or by solar radiation. Then Saturn's magnetic field carries the hydrogen and oxygen out to Titan, where they react with methane, also broken up by solar radiation, to make carbon monoxide. Solar radiation breaks up the nitrogen, methane, and carbon, sparking reactions that make the heavier molecules Cassini detected.